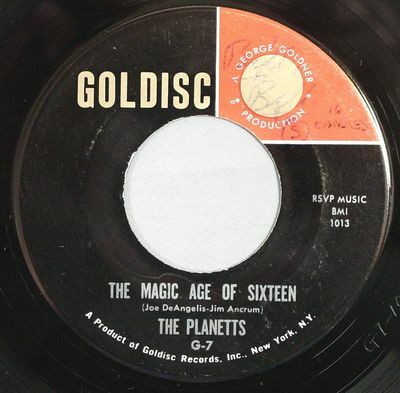 This is a vintage original pressing doo-wop 45 rpm record GOLDISC 7 by The Planetts from 1963 in EXCELLENT (EX) CONDITION. See below for more details on this grade and listen to the song samples as they were recorded directly from this record. Labels are in excellent condition with just slight surface wear. There is writing on the labels. See photos. To hear a song sample, click on the sound bar arrow under the word “AUDIO”. I add new records, and/or re-list unsold records with reduced prices, just about every day. Song samples were recorded directly from the actual record described above. These samples are provided to give an idea of the songs and hopefully give an indication of the quality and condition of the record. Every effort was made to capture the sound faithfully, including any imperfections, without any filtering, equalization, or other enhancement. GRADING: Records have been carefully cleaned and label stickers removed when safe and possible to do so. Records will come with a medium weight golden Kraft paper sleeve. These are superior to plain paper sleeves. After 30 plus years of collecting and selling records and music related items, most agree that I am a strict grader. Records are both play graded and visually graded. I only deal in collectible quality items. I don't bother with records with cracks, chips, skips, warps, or major wear. The grading system described below I think is the one everyone is familiar with. M or M- means PERFECT or NEAR PERFECT. A record that looks and plays like new, or perhaps just a hint of use or handling. No imperfections and no surface noise. If it looks like it has been used or there is some background noise, it is not mint. EX means EXCELLENT. A record that has been played, stored, and handled carefully. Sound quality is easily good enough to record or broadcast. There is negligible background noise. Recorded music and vocals are crisp and clear with no distortion. Only a few small surface scuffs, and maybe a couple of very light, small, surface, hairline scratches, neither of which cause any noise. Vinyl is shiny, almost like new. VG+ means VERY GOOD PLUS. This is a record that sounds and looks better than very good (VG), but not quite as good as excellent (EX). There may be light, uniform background noise that is well below the level of the music. Good shine on the vinyl. VG means VERY GOOD. Barely noticeable, uniform background noise that is well below the level of the music and certainly not distracting. Music is still clear with very little distortion, if any. A few noticeable surface scuffs and scratches that may contribute just slightly to noise. Possibly a few isolated light clicks or pops. May still be recordable, but some light, non-distracting background noise could be detected on the recording. A majority of the shine is still left on the vinyl. G = GOOD. GOOD does NOT mean bad. This record is still a worthy addition to a collection. There is noticeable background noise that may not be uniform and is approaching the level of the music. Music clarity may be fading and some distortion may becoming obvious. The record has several obvious scuffs and scratches, some of which may contribute to noise, such as clicks or pops. The vinyl has lost some of its sheen. P or F = POOR or FAIR. The record looks bad and probably plays badly. There are NO skips, but certainly there is noise. Many obvious scuffs and scratches contribute to noise and are probably distracting. Vinyl has lost most or all of its sheen. I will generally only list rarer items in this condition. Any other defects, such as label tears, stickers, tape, wear, etc. will be noted individually and hopefully will be obvious in the photos. Exact DOMESTIC shipping cost will be extra based on shipping destination and package weight. We ship United States Post Office regular parcel post, but will also ship priority if you request it. INTERNATIONAL orders will be quoted individually based on location and package weight. We will ship the cheapest way, unless you request a specific method, based on the United States Post Office on-line international rates schedule WWW.USPS.COM. To save you shipping costs, we will combine multiple items into one box when it is practical to do so. Generally this means the box cannot be larger than a 16 inch cube or weigh more than 25 pounds. Please let us know of your intention to purchase additional items so that we do not send you an invoice until you are ready. All payments are to be made in United States currency through PayPal. We will ship your package within 2 days or less after receipt of payment. We will refund all charges, including shipping cost both ways, if you wish to return an item because we have not been accurate in our description to your satisfaction. Please let us know of any problems within 5 days of receipt. We are particular collectors too, and we clean when appropriate, grade, and describe items as if we were buying them for ourselves. Thank you and good luck. Mike.